As more and more citizens learn which species are off limits, the government is struggling to keep up with the pace of people turning them in. Authorities were explaining the rules governing protected animals to residents of this North Sumatran village when a man appeared, carrying a small, scaly creature by the tail. It was a live pangolin, the world’s most trafficked mammal. The man had been catching them in the forest and selling them to brokers, who smuggle them to China and Vietnam in a thriving international trade. “Now we know these animals must be protected from the threat of extinction,” Putra Alam Tarigan said. Putra Alam Tarigan carries a critically endangered Sunda pangolin (Manis javanica) he caught hours earlier. He says that now that he knows the the creature is facing extinction, he wants to help end the trade in its body parts. Photo by Ayat S. Karokaro/Mongabay-Indonesia. Tarigan, left, looks on as wildlife conservationist Rudianto Sembiring, center, and a representative of the North Sumatra BKSDA examine the pangolin, which has curled into a protective ball. Photo by Ayat S. Karokaro/Mongabay-Indonesia. President Joko Widodo has made raising awareness about Indonesia’s conservation laws a priority in a country with some of the world’s richest biodiversity. More and more citizens are learning it is illegal to keep many creatures as pets, hunt them for sport or sell them to traffickers. But conservationists point to a problem: as animal confiscations increase, the government is running out of places to put them. “As more people surrender their animals, our facilities have actually surpassed their capacity,” said Hotmauli Sianturi, head of the North Sumatran branch of the Natural Resources Conservation Agency (BKSDA). The president’s actions, alongside grassroots efforts by local authorities and NGOs, appear to be having an effect. Last Nov. 5, on National Love Flora and Fauna Day, Sianturi’s office received an Asian leopard cat (Felis bengalensis), a Sunda slow loris (Nycticebus coucang) and nearly two dozen exotic birds from citizens who claimed to have previously been unaware of the law. The month before, a man handed over his pet saltwater crocodile (Crocodylus porosus). He had kept it in an enclosed pond behind his house for 13 years. 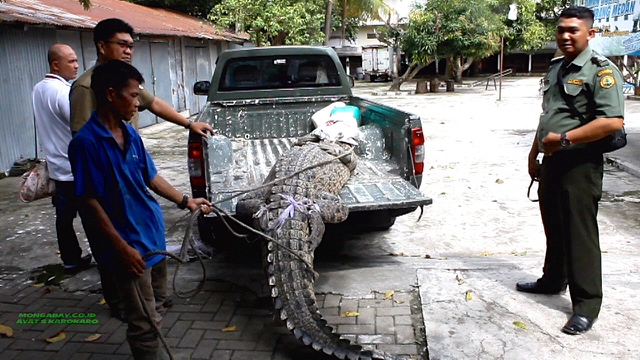 A North Sumatran man surrendered this crocodile to authorities last year. He said he didn’t know it was illegal to keep it as a pet. Photo by Ayat S. Karokaro/Mongabay-Indonesia. Authorities load the crocodile into the back of a pickup truck. “It kept growing, so I asked my friends, and they advised me to hand it over to the BKSDA,” the owner said. Photo by Ayat S. Karokaro/Mongabay-Indonesia. Like Tarigan’s pangolin, most rescued animals are immediately set free. But poor health is a top reason why some in North Sumatra are taken to the BKSDA’s main wildlife sanctuaries in the province, in Sibolangit and Barumun. Some animals are injured so badly they can never be released. Among other creatures, the Barumun facility is now taking care of a female Sumatran tiger (Panthera tigris sumatrae) whose leg was amputated due to snare wounds. During the first half of 2017, the center received from people who turned them in six eagles and 10 siamangs (Symphalangus syndactylus). That does not include confiscations from illegal traders. During the same period, the Sibolangit shelter received from contrite citizens 21 animals of nine species, from slow loris to white-crested laughingthrush (Garrulax leucolophus) and white-bellied sea eagle (Haliaeetus leucogaster). The facility is also rehabilitating five Sumatran orangtuans (Pongo abelii) transfered from West Java and Aceh provinces. “The capacity at both Sibolangit and Barumun is already full and unable to take in more animals,” Sianturi said. Dedicated facilities exist to receive some species. The nonprofit Sumatran Orangutan Conservation Programme (SOCP) runs a rescue center for the apes outside Medan, the provincial capital. 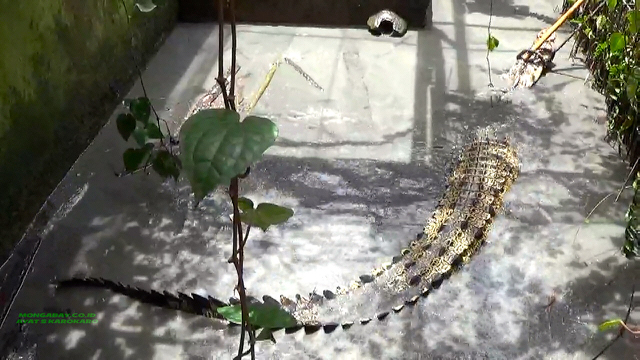 Visitors to the Asam Kumbang Crocodile Park in Medan can pay $2 to feed the beasts a live duck. For other creatures, authorities have had to improvise. The SOCP has temporarly housed gibbons, sun bears (Helarctos malayanus) and slow lorises on occasion, although they try to focus only on orangutans and to have other species relocated elsewhere as quickly as practically possible. The overcrowding has sometimes forced Sianturi to turn to Indonesia’s zoos, which are generally known for poor management and outdated facilities. The infamous Surabaya Zoo has seen large numbers of animal deaths, for example. Sianturi recently sent a reticulated python (Malayopython reticulatus) to the Pematang Siantar Zoo. The Ministry of Environment and Forestry said in 2015 that only four of 58 registered zoos in the country were decent and appropriate, while the rest were either improper or not yet accredited. “It’s not just in North Sumatra — they have the same problems throughout the country,” said Ian Singleton, the SOCP’s director. A rescue center on Bali island is overcrowded, for example, with 89 individuals as of March. Most are unlikely to be released, according to in-house veterinarian Dyah Ayu Risdasari Tiyar Novarini. 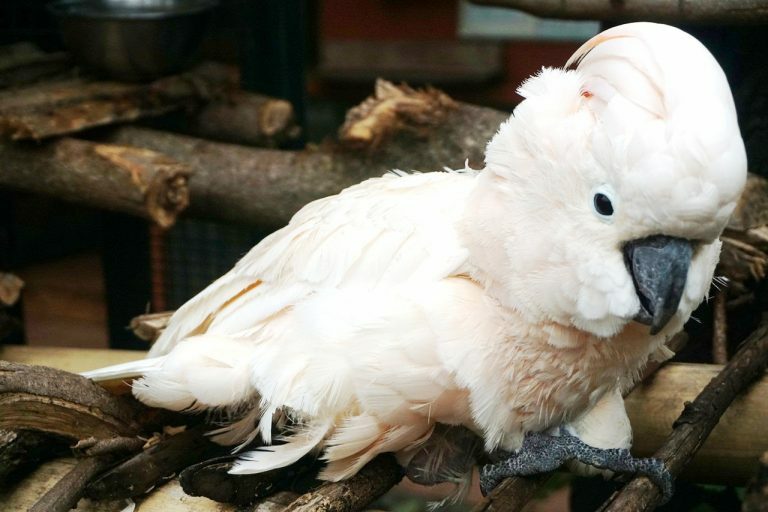 One resident, a Moluccan cockatoo named Martha, had to have her leg amputated after it became septic from being chained up by her previous owner. In May 2015, the arrest in the Javan port city of Surabaya of a man with 23 yellow-crested cockatoos (Cacatua sulphurea) stuffed in plastic water bottles prompted a deluge of reports from citizens wanting to surrender their pet cockatoos to the state. Martha, the cockatoo whose leg was amputated. Her caretakers say she can never be released. Photo by Luh de Suriyani/Mongabay-Indonesia. Minimal allocation from the provincial budget and inefficient bureaucracy in the process of releasing animals are the main causes of overloading at rescue centers, said I Gede Nyoman Bayu Wirayudha, a veterinarian and founder of the Bali-based Friends of the National Parks Foundation (FNPF). “It’s very much likely that rescue centers are no longer able to set free the animals back to the wild because of this condition,” he said. But allotting more cash to expand rescue centers doesn’t quite fix the core issue, the SOCP’s Singleton suggested. Perpetrators of wildlife crimes, including animal trading, are charged under the 1990 Conservation Law, which stipulates a maximum punishment five years imprisonment and a fine of up to 100 million rupiah ($7,490). But in practice, suspects almost always receive a much softer sentence, or none at all. By comparison, the maximum penalty for a wildlife offense in Vietnam was recently raised to 15 years behind bars. The change is incorporated in the 2015 Penal Code, which was finally approved by the Vietnamese National Assembly in June. The Indonesian House of Representatives is considering its own revision of the 1990 Conservation Law, with green groups calling for harsher sentences, provisons on online trading and more. In the meantime, Sianturi doesn’t let the challenges discourage her from campaigning against the illegal wildlife trade and from rescuing more animals. “All of the rescued animals in Sibolangit and Barumun are in the rehabilitation process and, hopefully, they can be released back to the wild,” she said.